The Tour F was discontinued due to a strike by the USRSA over weaving another cross right? I prefer 18x20 and most yonex I’ve hit with feel that dense aside from the newish code 95. Did any of you guys try the 310? How did you like it? To bad Rancher and some others stubornly keep telling us that only with super heavy swingweight racquets, pros can hit heavy shots. Maybe on AO Tiafoe added some lead but that did not effects his shots much. Define the term spin weight, or stop posting. Or are my posts going to removed again? No i wont. Introducing yet another term like 'spin weight' doesnt clarify the discussion at all. I all invite you to examine the learning site of Tennis Warehouse, the TWU data, where racquets are compared. There you can easily find out, the higher the swing weight, the more power, but at the expense of spinpotential. So you cant have both, more spin AND more power potential. Ofcourse they are talking about the same effort. If you look at the muscles in Nadals arm you understand why he may have such power and spin in his forehands. A more normal built player has to choose. Djoker hits more flatter shots obviously. In a nuttshell, dont try to invent the wheel again. Its all already done by TWU. That's twist weight. Where you trade spin for power. I'm literally the last person you should be spouting off nonsense to. I did an entire video about the topic. Spin weight is directly related to the racquet's swing weight, and is the lateral moment of inertia on an axis the same 4" height on the handle as swing weight. And is the value used in conjunction with angular acceleration to determine the amount of torque the racquet will produce on contact that can be used to create spin. The thing is, since it's only dictated by the same factors that increase or decrease swing weight, you functionally only focus on swing weight. This is why the forums are bad. You prove nothing, because it's clear you understand nothing. Prove it with any article you can find on TWU. I'd love the free content. Because I'm sure another one of my posts will get miraculously removed for "flaming"
I all invite you to examine the learning site of Tennis Warehouse, the TWU data, where racquets are compared. There you can easily find out, the higher the swing weight, the more power, but at the expense of spinpotential. So you cant have both, more spin AND more power potential..
100% false. This is not at all what TWU data even suggests. My findings were based off twu data and I've done a video about just this. The place where you trade spin for forward power is in the polar moment of inertia or twist weight. Decreased twisting means less spin production in the lower hoop, but an increase of spin in the upper hoop. Ofcourse they are talking about the same effort. If you look at the muscles in Nadals arm you understand why he may have such power and spin in his forehands. A more normal built player has to choose. Djoker hits more flatter shots obviously. So what you're saying is, nadal has topspin because he has strong arms. So what do strong arms do, exactly? Explain to us with your understanding of TWU data (Link it please) how his arms make more spin. What you're saying is just so wrong it would only fly on TT forums. I can put down a huge amount of money it's an RD7. RD-7 isn't as round as the images of tiafoe's racquet. Can't be. It is 100% a Duel G. Just look at close up pics of his racquet on Getty images... you can see the unique Duel G throat detail under his Vcore Pro paintjob. RD-7 mold is so different to a Duel G I cannot see why anyone would make such a statement lol. Federer's FH spin rate is only a couple of hundred rpm behind Nadal's topspin rate. Federer's slice backhand has the highest spin rate ever recorded. I am not sure that muscle bulk equates as much to power and spin as your post suggests. Sure you have to be a world class athlete to hit world class speed and spin but some of the leaner players have loads of spin and power. Guga had tremendous spin rates on his 1HBH and he had arms like trigs but they were long and provided a lot of leverage. Also, a racket with a SW that is simply too low will suffer lower power AND lower spin rates. I've experienced this first hand. I've added weight to the head to increase the SW and felt like power and spin rates were both improved. An underweighted racket head gets pushed around and suffers lower power and lower spin rates. I think at some point you can increase the SW too much and begin to see lower spin rates but practically none of the stock rackets on the market today have a SW so high that it would inhibit spin. Yea, I don't think spin is correlated to muscle bulk. Federer has some of the highest topspin and underspin rate on tour and his arms aren't that bulky. Guga is another example of a lean player with high spin rates. There are others that fall into the muscle category too like Muster and Vilas as they both muscled the ball a lot. But, lots of skinny arms have great power and spin. I think it is more technique and timing. of course, you to have great fitness but almost all the pros have great fitness. I find a lot of players are getting much more out of their strokes between 345-370sw. There are a lot of other variables to be included, but from what I've seen with real rec players they get a lot out of higher than anticipated SW. I ve understood that Sock hits with even more topspin, yet his racquet is an ordinary of the shelf Babolat Aero Storm tour or equivalent pro stock, so NO high swingweight. Same story with Thiem actually, who even began his climb to the top of ATP with of the shelves Babolat pure strikes of 305gr, that he maybe weighted a little after a few years, but thats not important. You guys only mention examples that fit your theory, but you forget that there are more roads leading to Rome. Maybe on AO Tiafoe added some lead but that did not effects his shots much. Play with the heaviest racket that you can, that doesn't affect your shots too much. His rackets were strung two-piece. Advertised as the 330g but when I had one on the scale a while back it was 312g unstrung with just an overgrip. It was stock balance too. 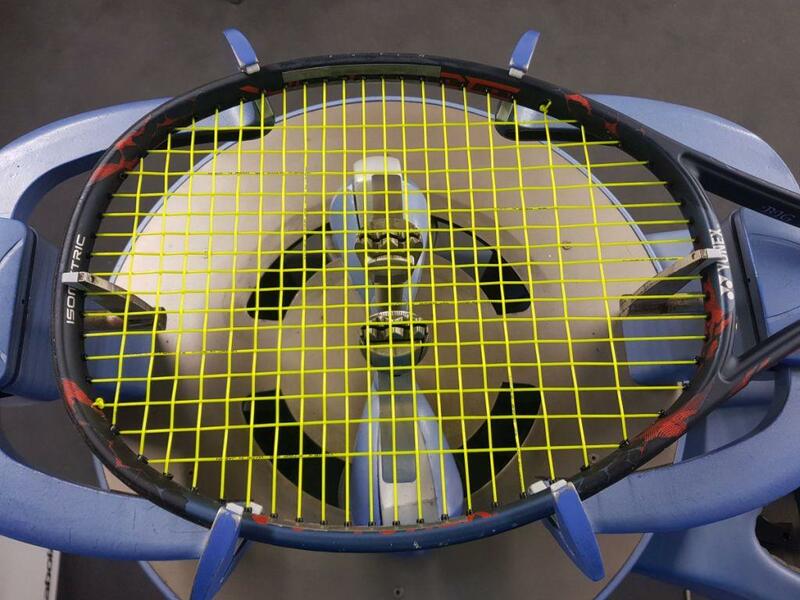 The unstrung weight and balance for the above racket was 313g and 32.0cm. Must have added weight at the end of last year. I have one sitting in my closet at home. One of guys trained at the same facility in VA as a junior and is friends with him. He was in his box at the Aussie Open this year. 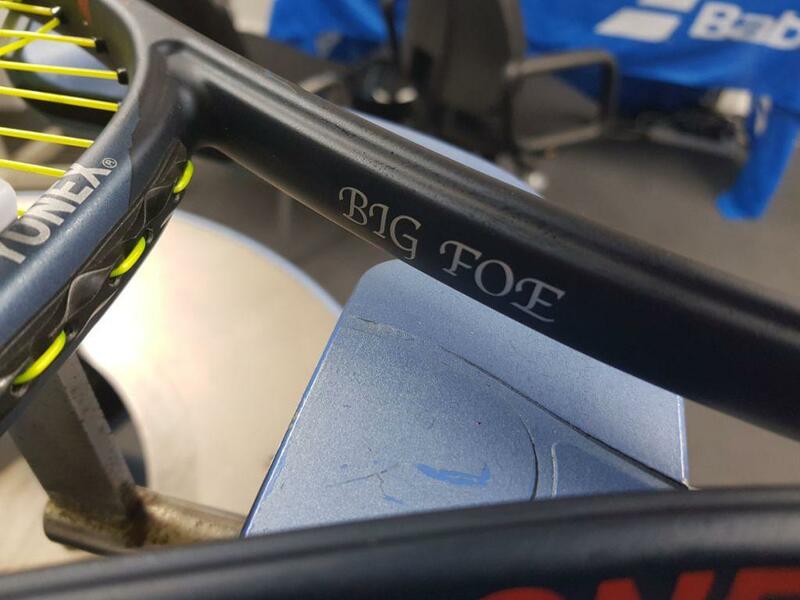 The racket I have isn't custom (no name) it just has the label from yonex stringing it at the Aussie open from 17 or 18. Are the unstrung specs with an overgrip? Yes,one piece; the mains end at the top. He is keeping the 20th cross, I thought Yonex wanted them to skip top cross to look like 19 or is that just how Chung likes his? I have not checked out Stan's, but with 95D not sure it's as easy to skip top cross. Oh, and BTW, where the hell has Chung gone to? Tiafoe no longer has lead at 3 and 9 as of Miami--must be all under the bumper and in the handle now. About time he got a better setup for his wristy game. Expect his results to become more consistent. That low tension doesn’t surprise me as Lux Savage is a low power string (even lower than 4G from my experience). I have a Yonex SV95 with that string and complements with it very well!! Funny enough, a friend gave me a bunch of different string and I've used Savage Lime in my Duel G 310, it's really nice. I strung it at 44 and it was really comfy and gave a really consistent stringbed. I think the 1.27 in the 16x20 made my stick super stable, I was getting some great reaction volleys. But it was not great on second serves because it's really not that geared, it's pretty smooth. If it came in a 1.25 or 1.22 it would have a bit more bite. 1 - With his higher SW Djoko still gives more spin to the ball than Fed. 2 - Federer doesn't hit a more spinny ball with his bigger headsize/lower SW racquet. It's quite the opposite actually ; he had stronger spin numbers when he used to enjoy his 90sq/inch 355+ sw racquet. But it may be a change of his stroke? Who knows. (Please don't try to answer that, @ron schaap , it's rhetorical). 3 - That with more SW, a smaller (95 sqinch) headsize, denser string pattern racquet can hit more spin than an open slightly bigger (97) head size racquet.